Louder Than War favourites LIINES are set tyo play a home town headline gig next Saturday, we strongly reccommend you get along to this gig, but to do so you may well need to get a ticket in advance; this one looks likely to sell out ahead of doors opening. 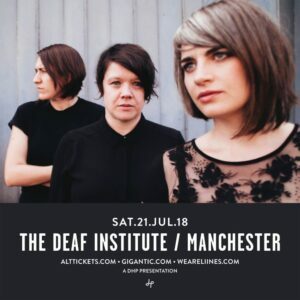 Announced last month, LIINES play their biggest headline gig to date at Manchester’s legendary The Deaf Institute on 21 July, with London trio BERRIES and Manchester newcomers Threads. Over half the tickets have sold – their last headline gig, at Night People in March, sold out ahead of time. LIINES are a prominent band in the post-punk / new-wave scene, with comparisons ranging from Savages to PINS to Desperate Journalist. Their sound is an infectious, urgent and at times furious blend of Riot Grrrl, post-punk and alt-rock sounds which take in elements of their collective influences. There’s the dark angular undertones and brooding introspection of Joy Division, the high energy of Pixies and the emotive, impassioned sound of Sleater-Kinney wrapped in catchy fast-paced riff-laden songs. LIINES have already hit some impressive milestones in 2018 – recording a Radio X X-Posure session for John Kennedy, as well as headlining his showcase in London; supporting Hot Snakes and The Membranes – the latter at the legendary Manchester o2 Ritz. As well as playing storming sets at Dot to Dot Festival in Manchester and Nottingham.